Well, now. That didn't take long! Jonathon Rodriguez took fate into his own hands this week. By purchasing an additional 500 shares, he ensured that he would take us past the 1,711 billion isk mark and earn himself a Supreme Protector's Tip of the Hat™. This illustrates another important lesson about buying New Order stock: If at first you don't succeed, try, try again. The fourth most populous country in the world is getting some representation in a way that truly matters: The Code is now available in Indonesian! Can you believe it? 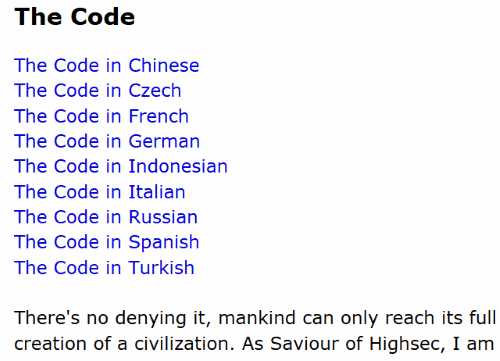 The Code is in ten languages now. That's one less excuse for being a Goblok. This is incredibly cool. Thank you Agent Talonblack! Kenny must have an inferiority complex. Hail to all the gagah agents of The Code! Praise James, the gagahest of all! Kill the gobloks until none remains! You fall on your head again Kenny?